From the title, you must have read that this was about a proposal. Let me just say, that Proposals are probably the most fun type of job I photograph. With all of the planning that one person puts into 'popping the big question' (from planning the right place and time, making sure the right people are let in on the big secret, and so on and so on! ), there is still a big level of spontaneity I love. Ross and I connected through an old friend. We sent a few text messages back and forth about where he was planning to ask his girlfriend, Dallas. He wanted to do it this past Sunday, but was worried about the St. Paddy's day parade around City Hall. The timing worked because it was well after the parade was over, but I told him I would scope the area out and find an alternative if needed. Well, come Sunday afternoon, I show up to City Hall in Philadelphia and there's barely a person around. I staged just off to the side and got a text from Ross that they are on their way. With my ninja like stealthiness, I followed them up the main walkway and started to snap away. Now, I couldn't hear any of what Ross was saying to Dallas, but I certainly could tell her shock and her answer. As Ross dropped to his knee to pop the question, Dallas dropped almost at the same time. With a lot of "Are you Serious?!" and "Is this for real?!" comments, they hugged and kissed and then I heard the "YES!" - The entire time, I knew Ross nailed it and I was smiling behind my camera for the both of them. 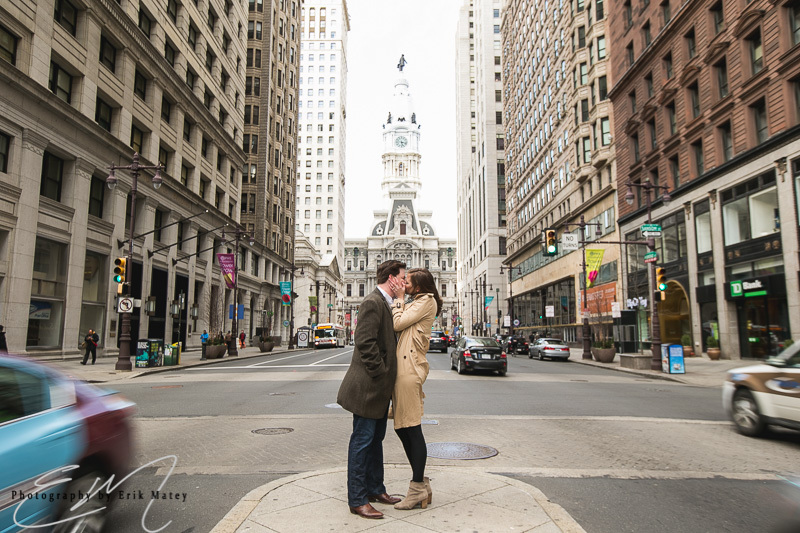 After they had a few moments, I introduced myself to Dallas for the first time - this was a surprise after all, and we spent a few moments walking around City Hall and Broad st to get some classic Philadelphia engagement photos.